^ 1.0 1.1 Einstein, A; B Podolsky; N Rosen. Can Quantum-Mechanical Description of Physical Reality be Considered Complete? (PDF). Physical Review. 15 May 1935, 47 (10): 777–780. Bibcode:1935PhRv...47..777E. doi:10.1103/PhysRev.47.777. ^ 3.0 3.1 Abraham Pais. 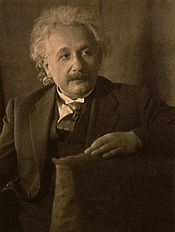 Subtle is the Lord : The Science and the Life of Albert Einstein: The Science and the Life of Albert Einstein. Oxford University Press. 23 September 1982. ISBN 978-0-19-152402-8. ^ 7.0 7.1 Aspect A. Bell's inequality test: more ideal than ever (PDF). Nature. 18 March 1999, 398 (6724): 189–90 [2010-09-08]. Bibcode:1999Natur.398..189A. doi:10.1038/18296. ^ 8.0 8.1 8.2 8.3 Blaylock, Guy. The EPR paradox, Bell's inequality, and the question of locality. American Journal of PHysics. January 2010, 78 (1): 111–120. ^ Ballentine, Leslie. Quantum Mechanics: A Modern Development 2nd, illustrated, reprint. World Scientific. 1998. ISBN 9789810241056. ^ Bohm, David. Quantum Theory. Courier Dover Publications. 1951. ISBN 9780486134888. ^ 13.0 13.1 13.2 Mermin, N. Is the moon there when nobody looks? Reality and the quantum theory (PDF). Physics Today. April 1985, 38 (4): 38–47. doi:10.1063/1.880968. ^ Vlatko, Vedral. Living In A Quantum World (PDF). Scientific American. 2011, 304 (6): 38–43. doi:10.1038/scientificamerican0611-38. Space and time are two of the most fundamental classical concepts, but according to quantum mechanics they are secondary. The entanglements are primary. ^ Bykovetz, Nicholas. Readers offer their own magic moments with John Bell. Physics Today. 2015, 68 (12): 8–9. ^ d'Espagnat, Bernard. The Quantum Theory and Reality (PDF). Scientific American. 1979, 241 (5): 158–181. ^ Detlef Dürr; Stefan Teufel. Bohmian Mechanics: The Physics and Mathematics of Quantum Theory. Springer Science & Business Media. 30 April 2009. ISBN 978-3-540-89344-8. ^ Fine, Arthur. The Einstein-Podolsky-Rosen Argument in Quantum Theory. Stanford Encyclopedia of Philosophy. Stanford University. 2009. ^ Alexander Afriat; Franco Selleri. Einstein, Podolsky, and Rosen Paradox in Atomic, Nuclear, and Particle Physics. Springer Science & Business Media. 1999. ISBN 978-0-306-45893-4. ^ John Archibald Wheeler; Wojciech Hubert Zurek. Quantum Theory and Measurement. Princeton University Press. 14 July 2014. ISBN 978-1-4008-5455-4. ^ Clauser, John F. Experimental consequences of objective local theories. Physical Review D. 1974, 10 (2): 526. Bibcode:1974PhRvD..10..526C. doi:10.1103/PhysRevD.10.526. ^ Eberhard, P. H. Bell's theorem without hidden variables. Nuovo Cimento B. 1977, 38: 75–80. Bibcode:1977NCimB..38...75E. doi:10.1007/BF02726212. ^ Schrödinger, Erwin. Die gegenwärtige Situation in der Quantenmechanik (The present situation in quantum mechanics). Naturwissenschaften. November 1935. 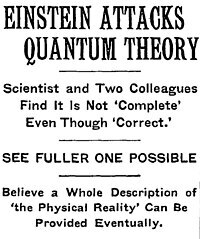 Einstein, A.; Podolsky, B.; Rosen, N. Can Quantum-Mechanical Description of Physical Reality Be Considered Complete?. Physical Review. May 1935, 47 (10): 777–780. doi:10.1103/PhysRev.47.777 （英语）.